Climate Change Australia – Is That Really Warming, Or Did You Just Adjust The Data? These are indeed, Orwellian times we live in. For the true believer, it is too awful to even consider that the Australian Bureau of Meteorology could be exaggerating global warming by adjusting figures. This doesn’t mean, though, that it’s not true. In fact, under prime minister Tony Abbott, a panel of eminent statisticians was formed to investigate these claims detailed in The Australian newspaper in August and September last year. The panel did acknowledge in its first report that the bureau homogenised the temperature data: that it adjusted figures. The same report also concluded it was unclear whether these adjustments resulted in an overall increase or decrease in the warming trend. Among satellites which study Earth’s temperature, 100% of them agree that Earth is not warming. By contrast, 100% of climate models are wrong. So how do climate experts respond to this? 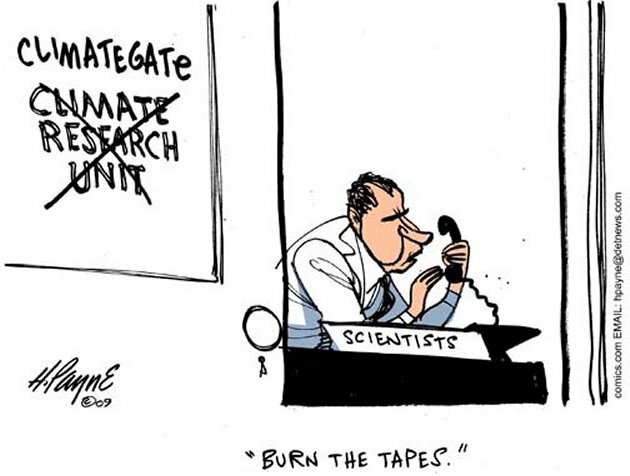 They ignore the best data we have from satellites, and rely on completely worthless climate models. It is time to revisit the emails leaked from the Climatic Research Unit (CRU) at East Anglia. The first 1000 emails were released in November 2009 just prior to the Climate Conference of the Parties (COP) 15 scheduled for Copenhagen. They effectively stopped political plans for a replacement of the Kyoto Protocol, a massive redistribution of wealth designed as part of Agenda 21. You can read what the UN says about this plan developed under the auspices of Maurice Strong as head of the United Nations Environment Progam (UNEP) or read Glenn Becks interpretation of the implications. Thanks to Tom Nelson for this compendium. U N B E L I E V A B L E.
Though 110% understandable when you have a global warming agenda to prosecute. And then they name-call anyone sceptical of this data manipulation, as “deniers” of science !? Wilsons Promonotory is the southernmost point in Victoria. Satellites show that there has been no warming there since the start of records in 1978. 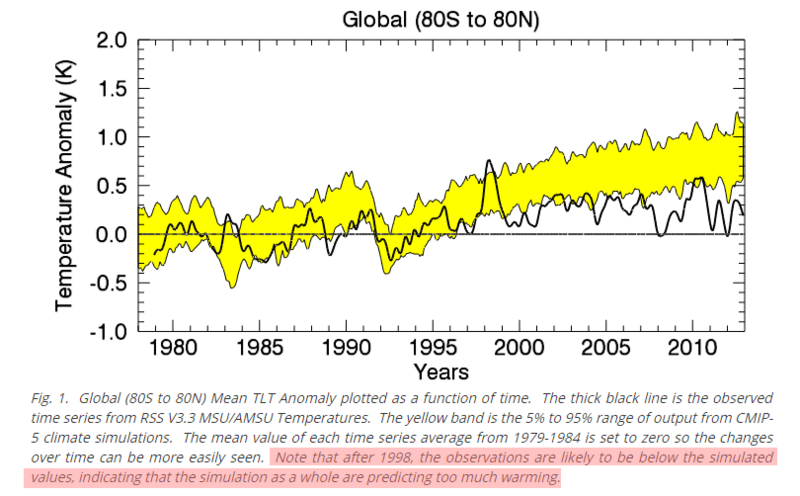 As of 2012, GISS showed no warming since the start of records in 1880. But since 2012, Gavin and Tom have added a spectacular hockey stick of post 1978 (satellite era) warming. The animation below shows their spectacularly fraudulent manipulations of the surface temperature data at Wilson’s Promontory. This warming does not exist. The fraudsters at NASA and NOAA simply made it up. Since Abbott’s knifing, and the appointment of warmist Turnbull, the UN has ‘opened a door’ for Australia at ‘high-level (warmist) talks’ in Paris. More Australian taxpayers hard-earned money siphoned off to the UN, to fix a non-problem. Not to mention our rights to be signed away on the dotted line. Will we get our money and freedoms back if the atmosphere stays in hiatus for another 18.9 years? The Guardian reports that Australia’s new climate alarmist Prime Minister Malcolm Turnbull, has not renewed outspoken skeptic Maurice Newman’s appointment as head of the Prime Ministers Business Advisory Council. 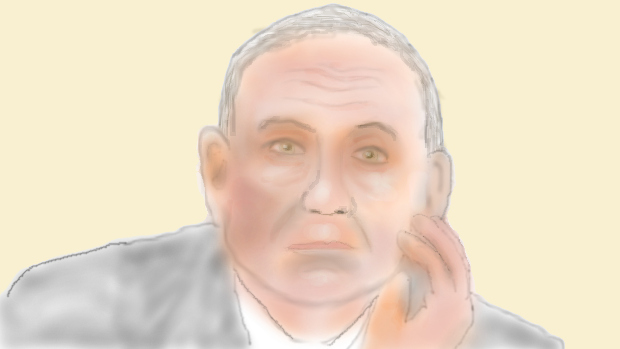 … Former prime minister Tony Abbott appointed Newman as one of his first acts after winning government in 2013. 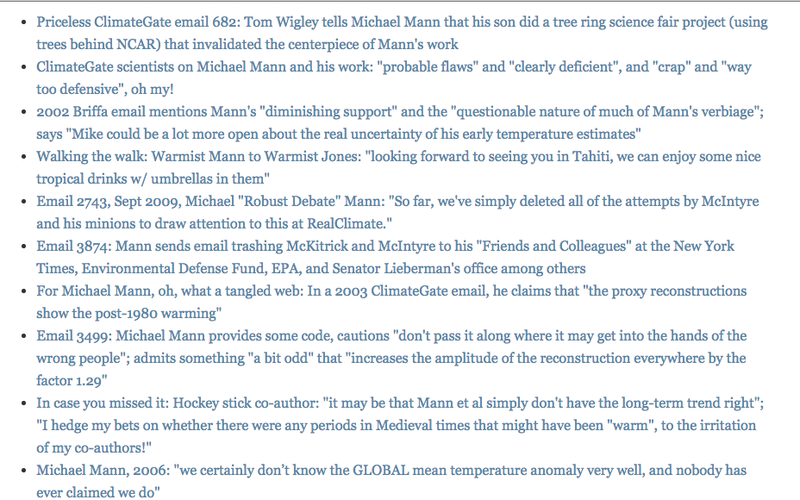 Newman has used a weekly column in the Australian to expound private views on climate change, including that the world was ill-prepared for a period of global cooling and that the United Nations was using debunked climate science to impose a new world order under its own control. You will be hearing a lot about 2015 having the fourth lowest minimum Arctic ice extent ever recorded. MASIE has very helpfully provided their records for the last ten years. Since stormy weather can affect both maximum and minimum ice extents, emphasis on March and September averages can be misleading. From a climate change perspective, a better metric is the average ice extent over the entire year. By that measure we gain a realistic perspective on the last ten years of Arctic ice fluctuation. And they want to jail people who question, or are ‘sceptical’ of whacko claims like this, and not the other way around? We live in truly bizarre and dangerous times. National Geographic published this spectacularly fraudulent hockey of sea level, along with this wildly false claim. Local measurements of sea level with tide gauges became common after 1880; satellites began global measurements in 1992. They’ve shown a clear acceleration: At an eighth of an inch a year, sea level is rising twice as fast as it was a few decades ago. NOAA says that sea level rise rates are one half of the fake National Geographic claims. This hockey stick is exactly inverted from the real data. 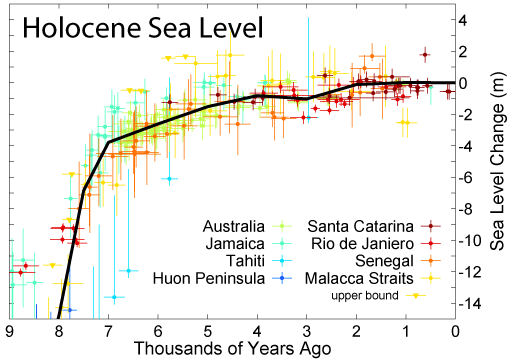 Sea level rise has slowed tremendously over the last seven thousand years.